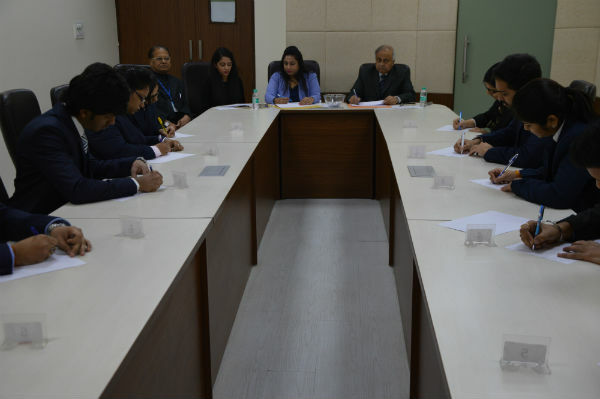 As a part of placement preparation, Dean PGDM Program organised a three-day Mock GD, PI on 11th, 12th and 14th December 2017 for the students of Batch 2017-2019. Since Recruiters these days use GD and Personal Interviews as a part of placement process, at JIMS, We ensure the students are trained on the same from time to time, so as to acquire and maintain proficiency. The entire activity was structured in two parts- Group Discussion and Personal Interview, which were held simultaneously. Each group consisted of 10-11 students while the panel comprised of three panelists. A quick overview on how the particular process would pursue was explained by the panel. The topic was allotted to the group in a random fashion. The topics covered almost all contemporary areas of discussion, for example, “Influence of social media on youth”, “Teachers Construct, Netas Destruct”, “Commercialisation of Medical Services- Good or Bad?” etc. As the students in the group discussed, each panelist recorded the observation. Once the discussion ended, overall observation along with an individual feedback was shared by the panel to individual students. The panel also focused on group behaviour and gave recommendation on polishing individual conduct. Personal interview is believed to be another major area of evaluation where individual competencies are presented. The students were assessed on the various areas such as General Awareness, Subject Knowledge, Job Vision, Communication and Body Language. The main purpose was to simulate the interview scenario and make them understand the importance of personal interview in a selection process. The interviewer supported the feedback of each student with the student’s own SWOT Analysis. All-embracing, Mock Session gave every student a scheme that identified the areas that need attention so the students works accordingly. Mock GD/PI sessions are beneficial for students. They help students to start practising early, to inculcate effective strategies, to improve their knowledge, to familiarise themselves with pressure, and act as a guide to move forward.